KEEP hands, arms, and legs inside at all times. USE safety equipment (seat belts & lap bars) where provided. OBSERVE age, weight, and height restrictions. 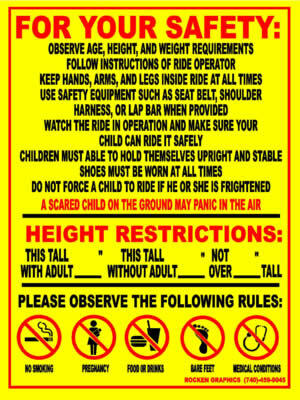 FOLLOW all instructions offered by the ride operator. At all of our events, each of the attractions get checked by a certified inspector, licensed by the Commonwealth of PA. However, riders also play an important role in having a safe, enjoyable trip to the carnival. It is very important that our guests act responsible and follow posted rules & restrictions for their safety, and the safety of others.